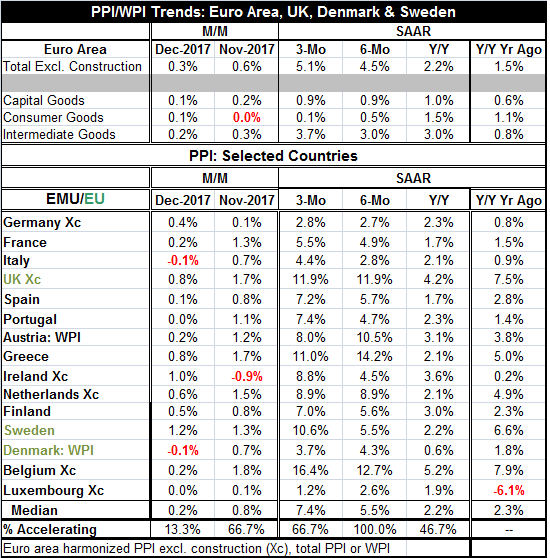 The PPI data now finalized and we can look at trends in a series of European countries as well as the sector trends in the EMU. The PPI rose by 0.3% in the EMU in December after a 0.6% advance in November. Inflation is gaining momentum from 12-month to six-month to three-month as the rate of PPI expansion has steadily risen. PPI meets Mr. Brent, how do you do? The chart (on the right) reminds us how much PPI pressure draws from trends in the oil market and that is true in this cycle as well. Inflation is oil, oil, oil! Inflation's sequential trends across the three main producer categories reveal a steady pace of inflation at 1% for capital goods, against a deceleration that is in place for consumer goods (as prices slow from a pace of 1.5% over 12 months to 0.5% over six months and to only 0.1% over three months). The acceleration that dominates the report and flows through to the headline comes from intermediate goods where oil and other commodity prices reside and work their mischief. Intermediate goods show inflation at 3% over 12 months and six months and inflation hopping up to a 3.7% pace over three months. Or is it? Is it? Is it? But the inflation process across countries is somewhat uneven, not uniform. If we rank countries by inflation over three months, six months and 12 months, as well as over 12 months for one year ago, the rankings for these groupings are not very stable or consistent. The three-month and six-month inflation rate rankings are highly correlated across countries with a correlation of 0.86. But comparing six-month inflation to 12-month inflation levels across countries produces a correlation of only 0.32. Comparing inflation over 12 months to 12-month inflation of one year ago produces a correlation of 0.27. Clearly, inflation is shifting in terms of where it bulges out and on what timeline. However, there are several consistencies. Belgium and the U.K. are ranked with consistently the highest inflation rates over the various periods (the U.K., not an EMU country, is still in the aftermath of a sharp drop in the pound-sterling, so this one is 'easy' to understand). France, Italy, Denmark and Luxembourg have consistently low inflation rankings. At the end of the day, we still blame oil! The upshot of these observations is that we can still put the inflation blame at the feet of rising oil prices. Beyond that, we have to wonder how much country-level stories structures and issues affect both the timing and the outright development of inflation. There still seems to be a lot of randomness in how inflation emerges across countries. And while the EMU headline shows impressive acceleration in progress, the EMU PPI sector detail points out that it is after all being driven by intermediate goods which points a big finger right back at oil. As for oil, a great deal has been made of the OPEC output restrictions and the cooperation of outsider Russia. And I agree that so far that has been impressive. But as the United States' oil production approaches a record 10.04 million barrels daily, trading volumes of U.S. oil, 'WTI' futures, have exceeded trading volumes of Brent crude. In 2017, the margin in favor of WTI was the largest margin in at least seven years. While Brent is a closely followed benchmark for Europe, the U.S. is making headway against it and at some point - and soon - OPEC and Russia are going to have a hard time absorbing and defecting the impact of the output increases we are seeing in the U.S. unless there is an explosion of global growth to stoke demand, or some major oil market calamity to shut down supply. From this, you could argue that 'OPEC' and Russia would have a vested interest in maintaining geopolitical instability, or at least, any instability that would put global oil supplies at risk.